"This Spanish language version of Robert Kalan's Jump, Frog, Jump! Is a gentle cumulative tale like "The House That Jack Built." 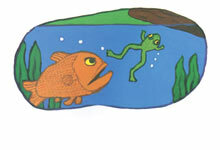 It follows a frog who chases a fly then is chased by a fish, a snake, a turtle, a net, and then a group of children. He escapes from each of these situations with the refrain "Salta, Ranita, Salta. "(Jump, Frog, Jump!) Bryon Barton's colorful, bold illustration show each approaching danger, and have the same crispness as the simple text. The translation is excellent, actually improving on the original text, with only very minor changes. The story is read by a female narrator; music and frog sounds begin and end the tape, the instructions and the story are entirely in Spanish. One side of the tape contains page-turn signals, the other does not. This would make a good listening center for very young children or those just learning Spanish."